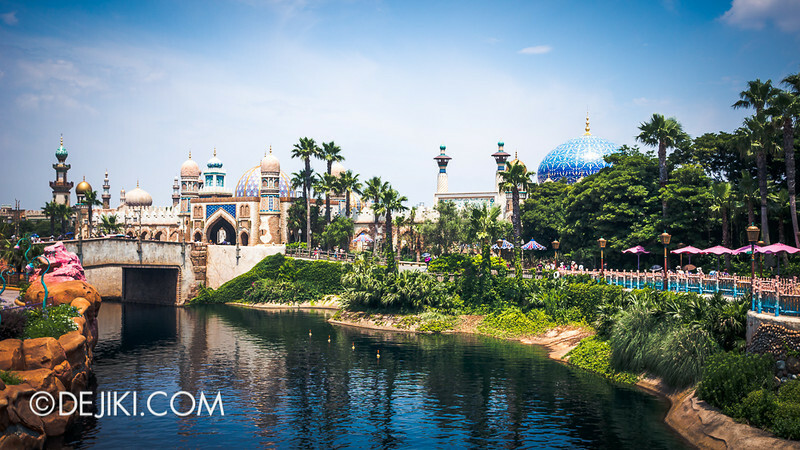 Arabian Coast is zoned into three areas. 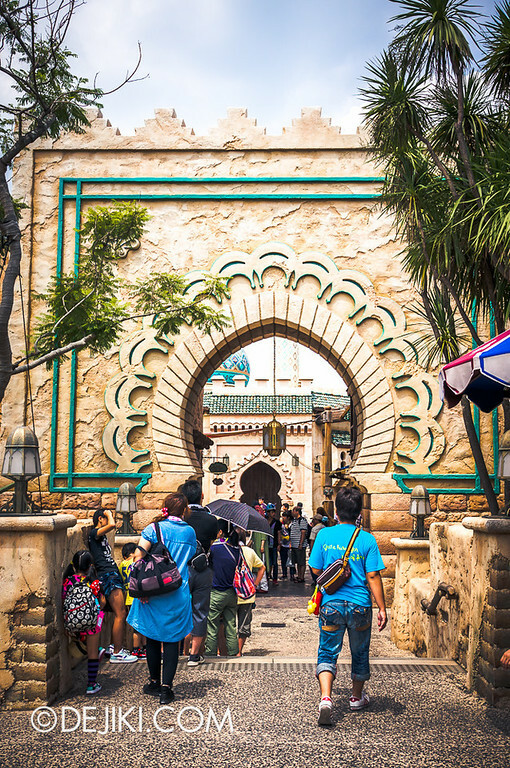 The Southern side (near Mysterious Island) is an opulent Palace Courtyard. 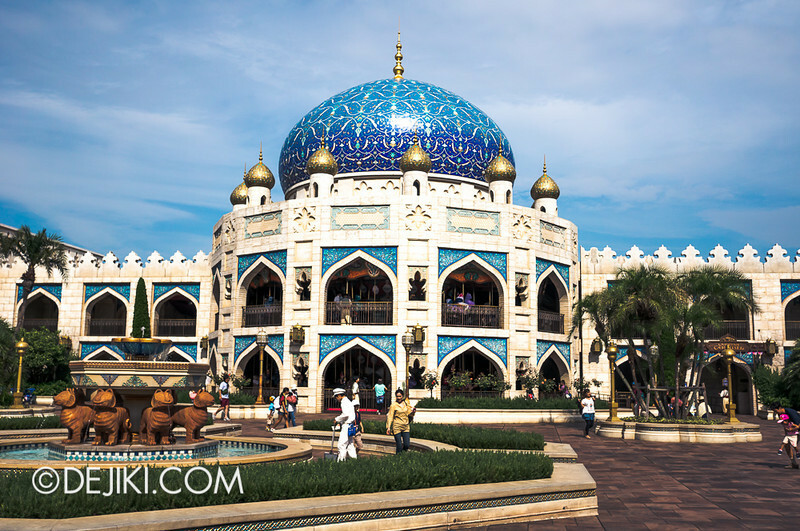 While many attractions and shops are based on Disney’s Aladdin, the Sultan’s Palace isn’t actually built here. 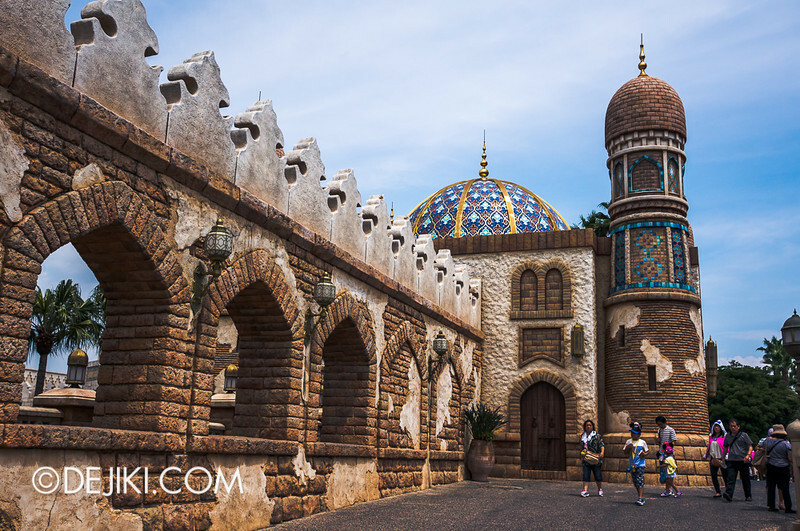 Instead there are more realistic architecture throughout the area, topped with stunning domes and towers. 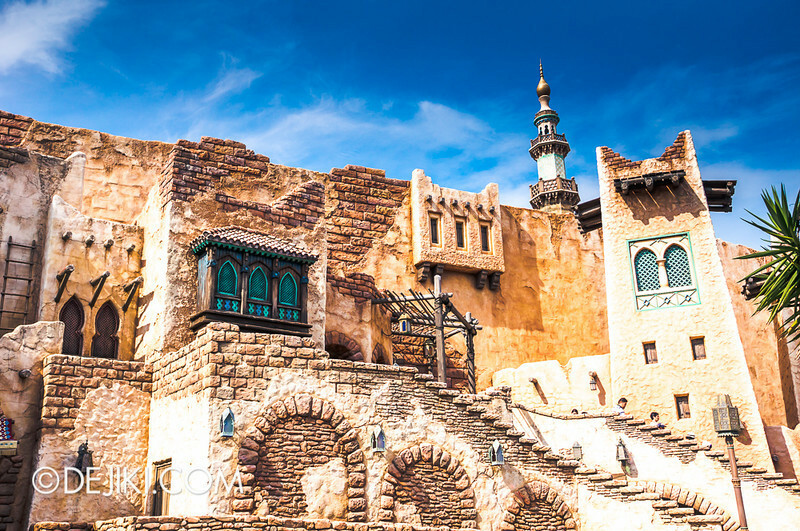 The Northern end is more weathered, and is home to Sindbad’s Storybook Voyage. Can you see Cinderella Castle? 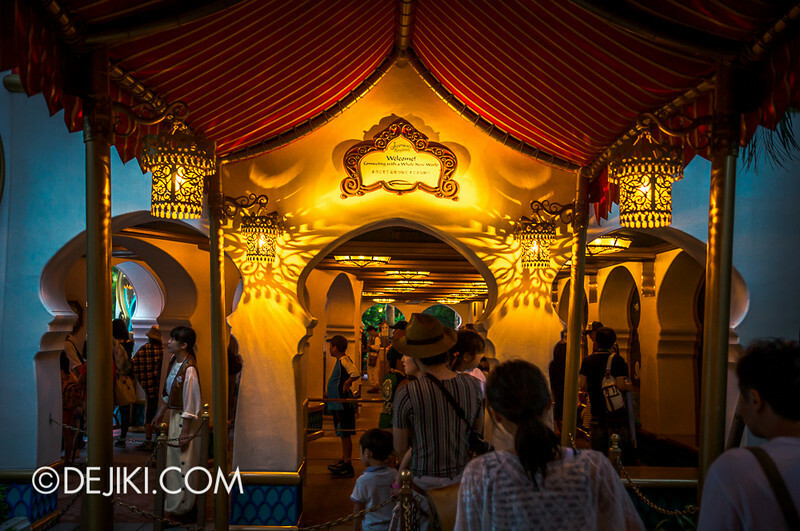 One of the attractions at the Palace section is Caravan Carousel, a double-deck Merry-Go-Round that is beautifully themed to match the area. There are limited number of Genies at the Carousel (which are the most popular seats), so cast members give out cards to allocate Genie seating. 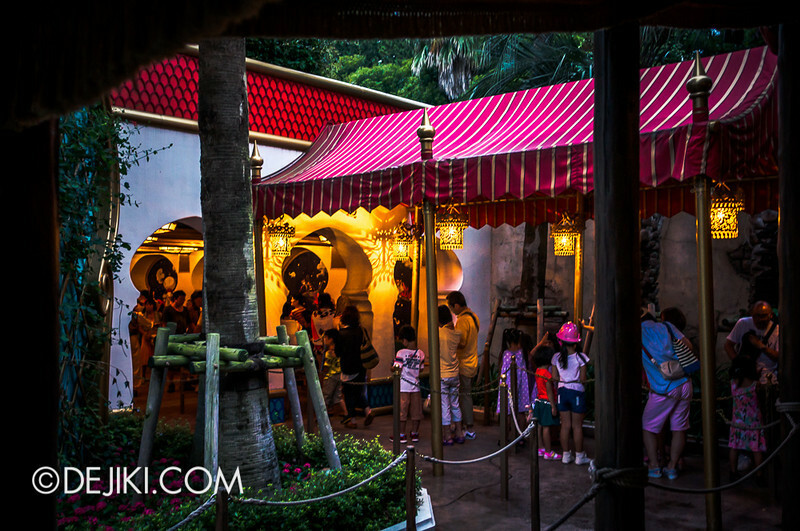 Be sure to ask a Cast Member if you want to have a Genie seat! 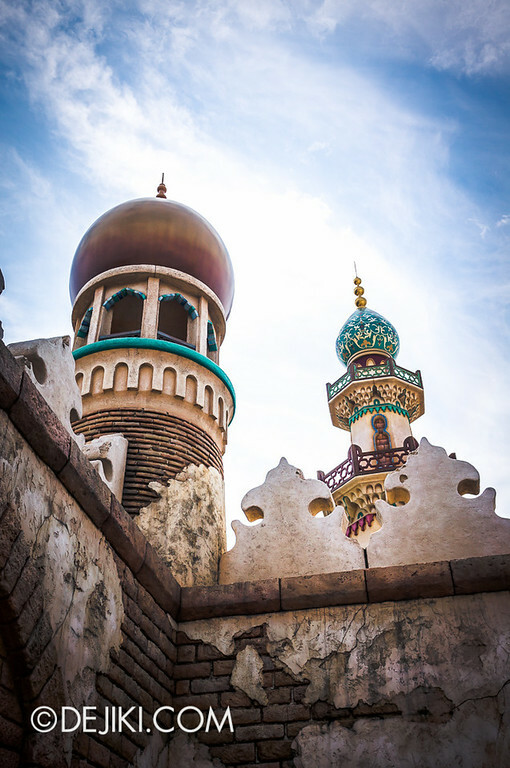 Perhaps the most notable attraction at Arabian Coast is the Magic Lamp Theater. It is a 3D show with live performers and special effects. This is nothing like a typical 3D movie however. You are made to believe that it’s an actual venue for live magic performances, not a movie theater. This is not a show about Aladdin. 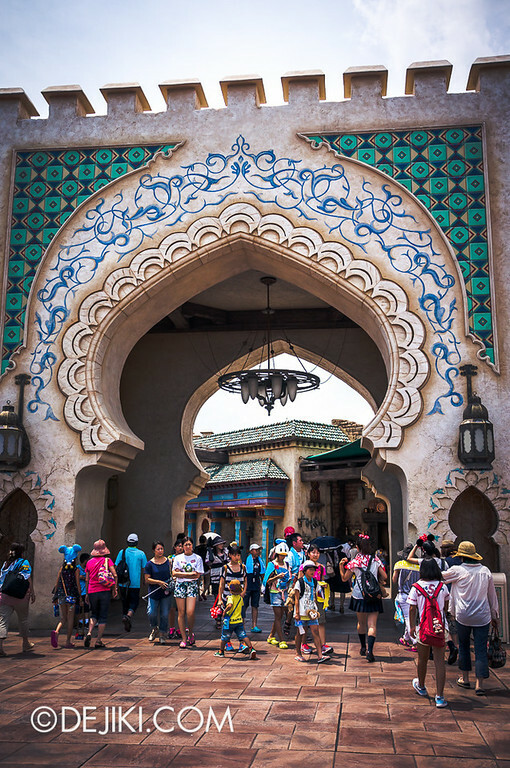 As the venue name suggests Genie is the star of the attraction. 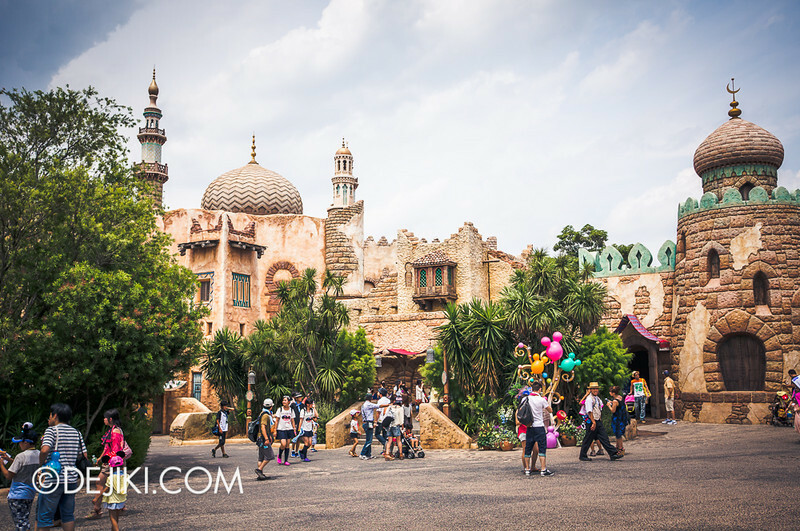 The story also involves around two new characters unique to the park: Assim (A “boy” character played by a female cast member) and Shaban. The two of them discovered the Magic Lamp. Shaban quickly took ownership of the Lamp and used a spell to make himself the greatest magician in the world. He then locked up Genie in the lamp. 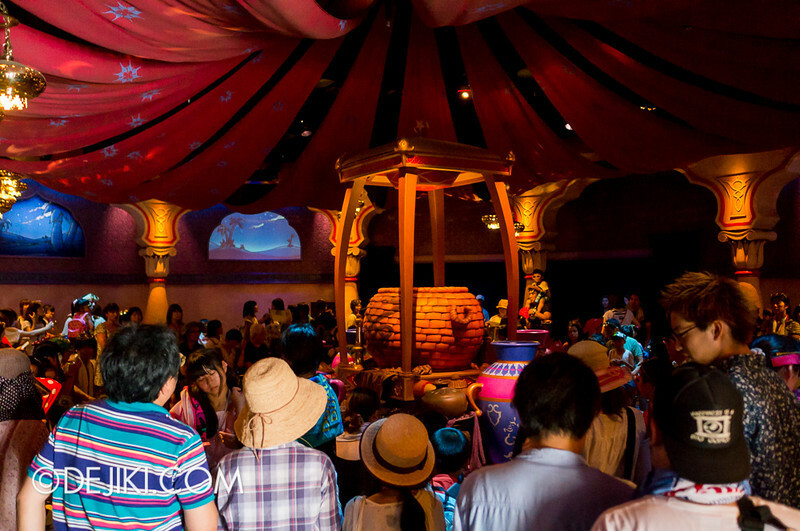 Guests enter the Magic Lamp Theater to witness Shaban’s magic tricks. Assim however, tries to find the lamp and free genie. Expect a show crammed full with comedic moments. An animatronic cobra will narrate the tale of Assim in the Pre-show Room. 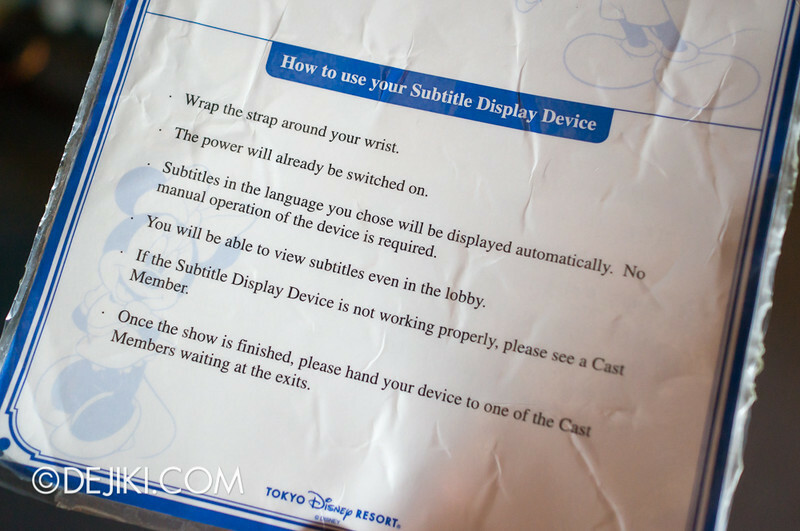 Be sure to ask a cast member for the Subtitle Display Device. Otherwise you’ll have no idea what’s happening during the show. The is certainly one of the best “hybrid” live shows I’ve watched, mainly because the performers are well integrated with Genie’s antics. There are some minor magic tricks performed on stage, but the main illusion is Genie himself. Please DO NOT skip this show! 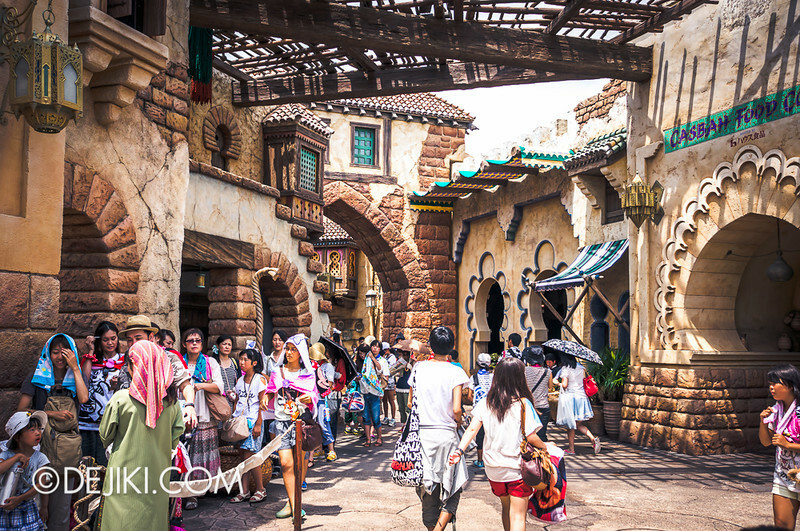 Let’s have a walk around the gorgeously themed Bazaar (or Souk) section of Arabian Coast. 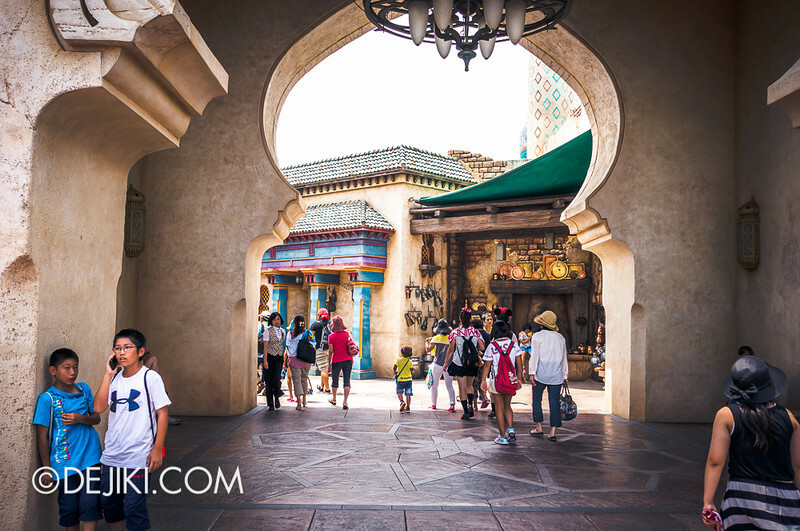 There is a merchandise shop here: Agrabah’s Marketplace, which supposedly includes Aladdin’s house. We completely missed that. 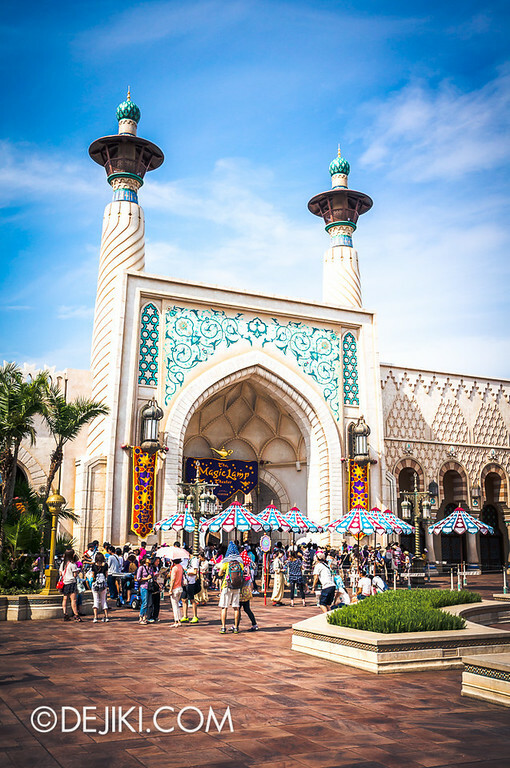 Abu’s Bazaar is reason why the area is bustling all day: Carnival Games! That’s what these guests are lining up for. I didn’t manage to take pictures of the games, but they are typical – skeeball and some other ball throwing game. They are popular because of the opportunity to win really cute plush toys at ¥500 a try. No, they are not plush toys of Abu, but popular characters such as Chip, Dale, Mickey, Minnie, Stitch and friends. Even if you are not successful, you will get some exclusive pins. I heard some people fail deliberately just to get the consolation prize. 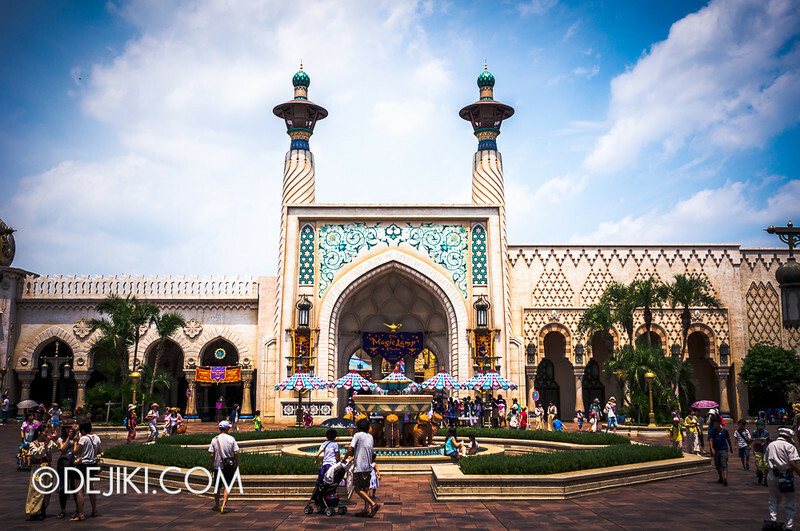 Even if the area’s attractions (obviously themed to Aladdin) do no appeal to you, I’m sure the architecture would. It’s stunning – so much details, so much colours. Definitely a lot of work went into the design AND maintenance. Does this park looked like it opened recently? YES. 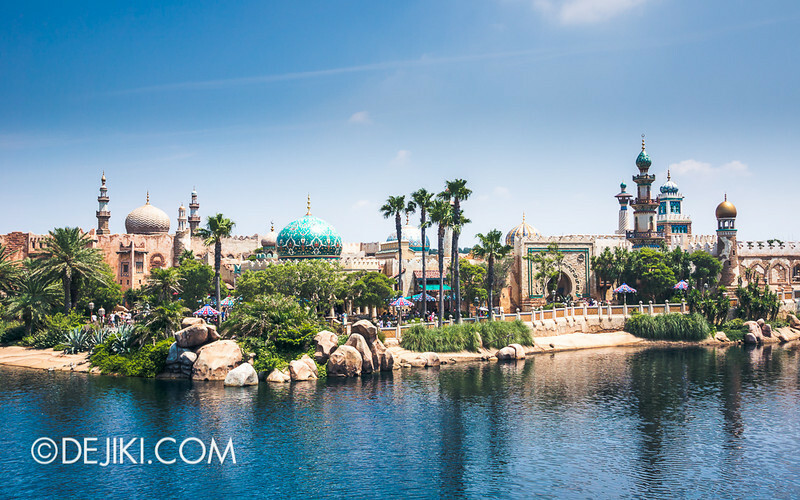 The Northern end of Arabian Coast is much peaceful. It’s a good place to rest and snack, as there are ample seating scattered all over. There is a food stall called Open Sesame here. I remember having Curry Pan from the stall a decade ago. It was so delicious because I visited the park during winter. Sadly the original booth is gone and in its place: Churros. At least it’s Mickey shaped. 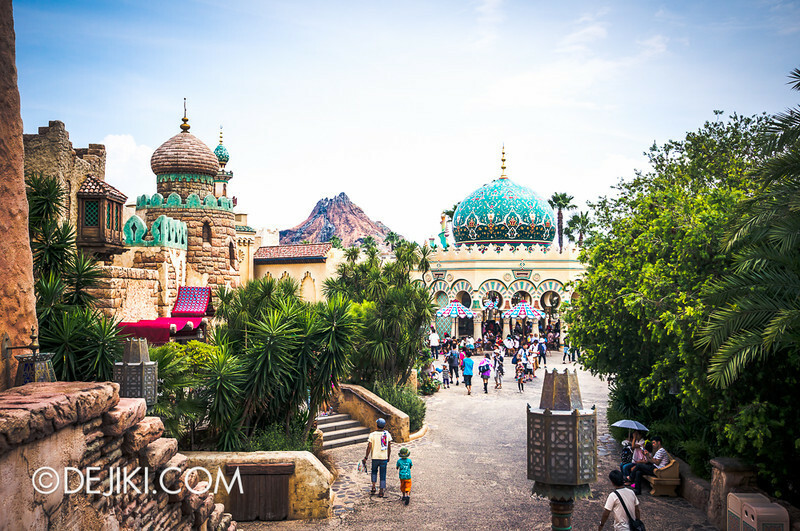 Gradually, the scene fades into the more weathered section of Arabian Coast. 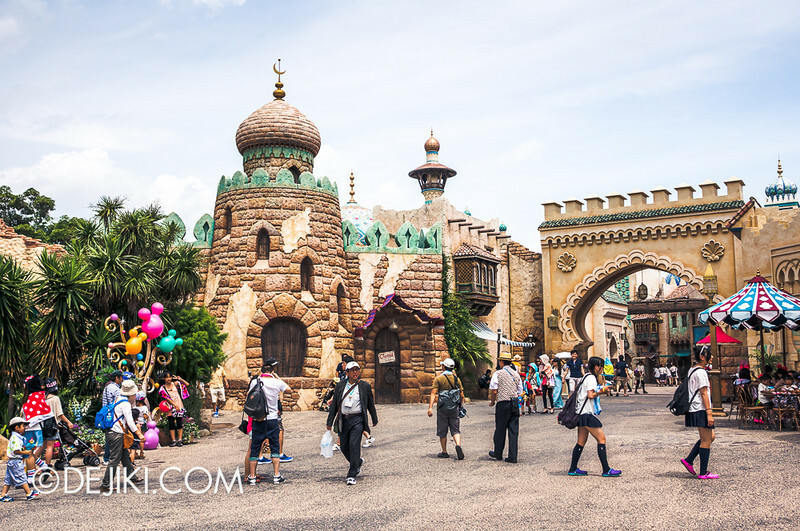 This wall of houses hides the Sindbad ride show building. Actually this is the ride’s exit. 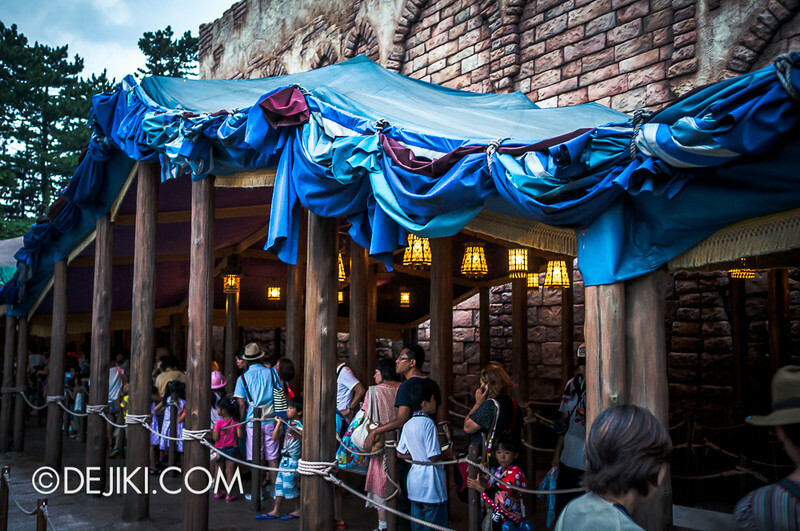 Which ironically… looks a lot better than attraction entrances at rival parks. The latest attraction at Arabian Coast is certainly an odd one. 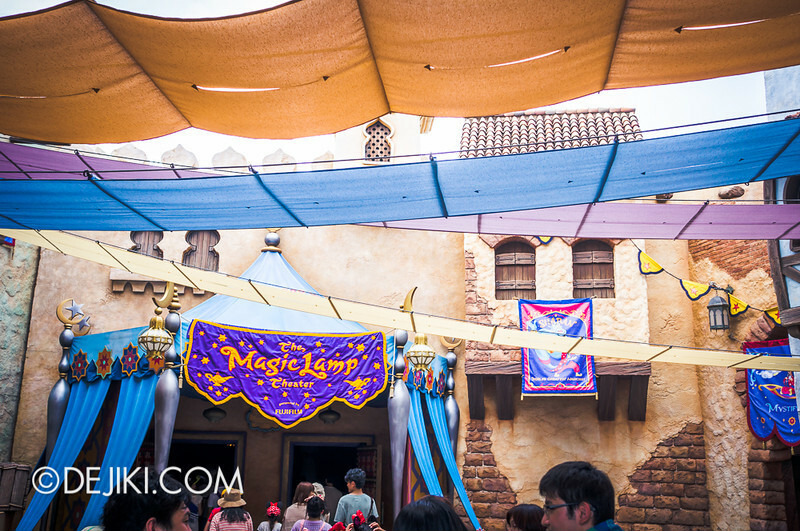 Why would Jasmine fly about in her Flying Carpet OUTSIDE Sindbad’s building? 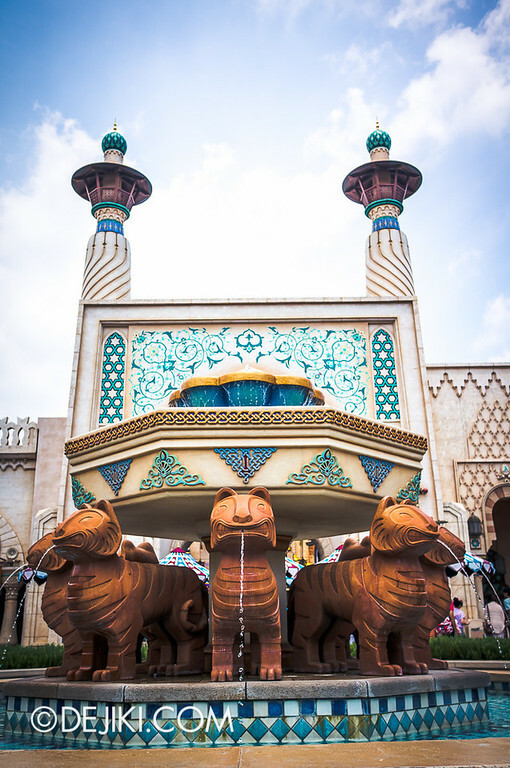 It’s odd that this wasn’t placed at the “Palace” section of Arabian Coast. Behold – probably the world’s most grand (and expensive) spinner! 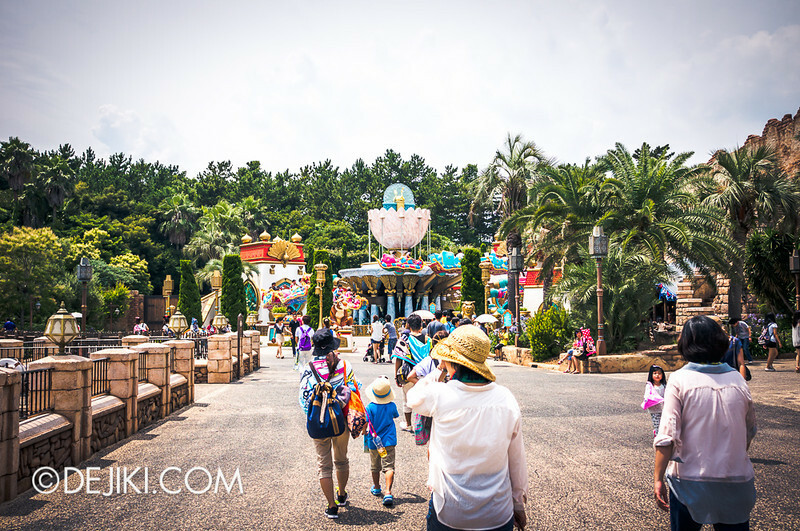 Well, according to the park, the attraction (and other added cost) amounted to 2 billion yen. That’s about S$25 Million in today’s money. Wouldn’t Dumbo be jealous? Wouldn’t everyone else be? I didn’t take photos of the ride itself as it was drizzling. What’s nice about this ride is: It looks really incredible. 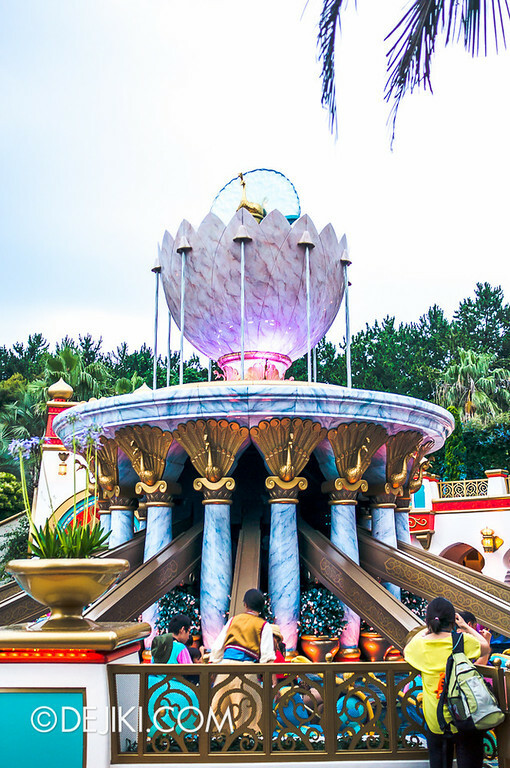 The fountain in the middle is really cool because it’s not water at all, but spinning elements to create the illusion of perfectly smooth flow of water – when the structure is spinning around. The carpets fly above a pool of water. 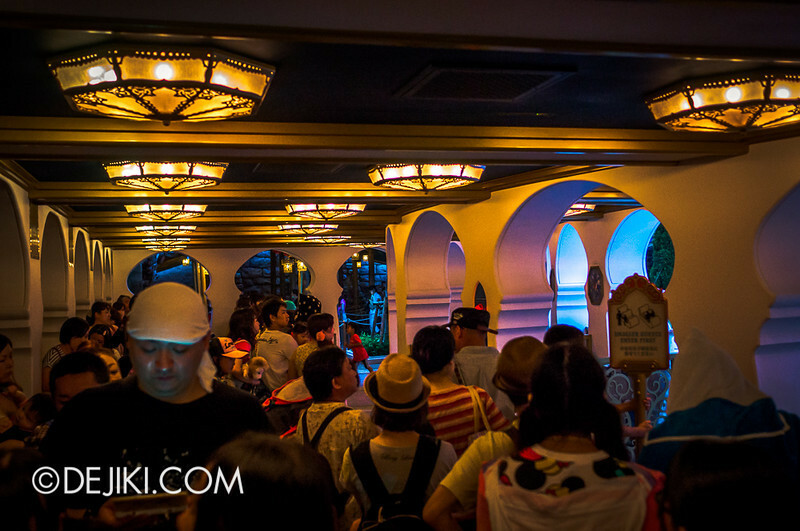 Here are some shots of the queue.. which seems too extravagant for a spinner ride. 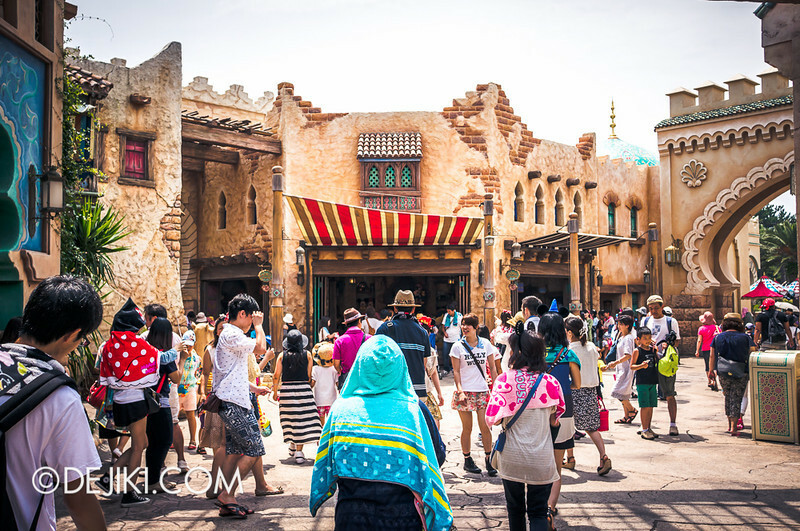 It can connect to Sindbad’s outdoor queue (which is probably never used 99.9% of the time). 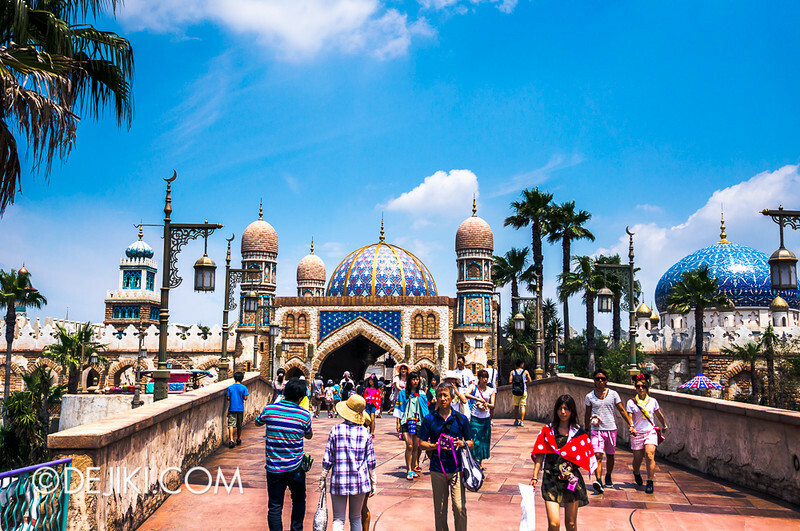 In the next entry, we will walk around Arabian Coast at night. 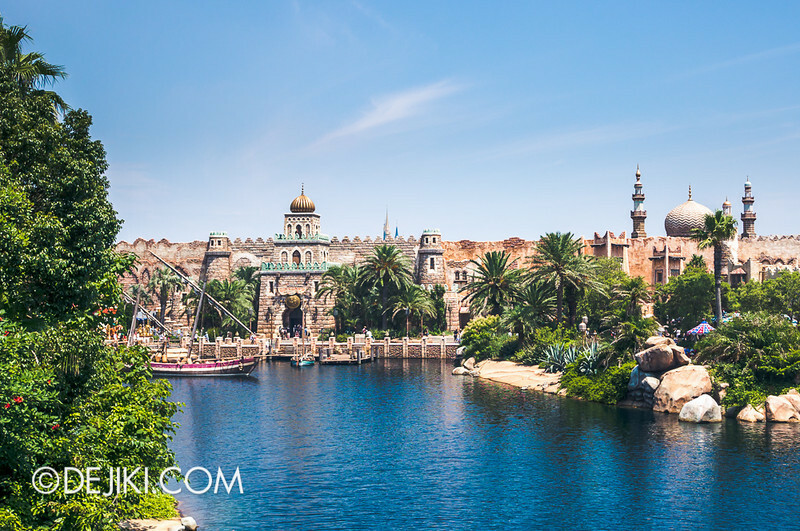 Your review of Arabian Coast was very thoughtful. 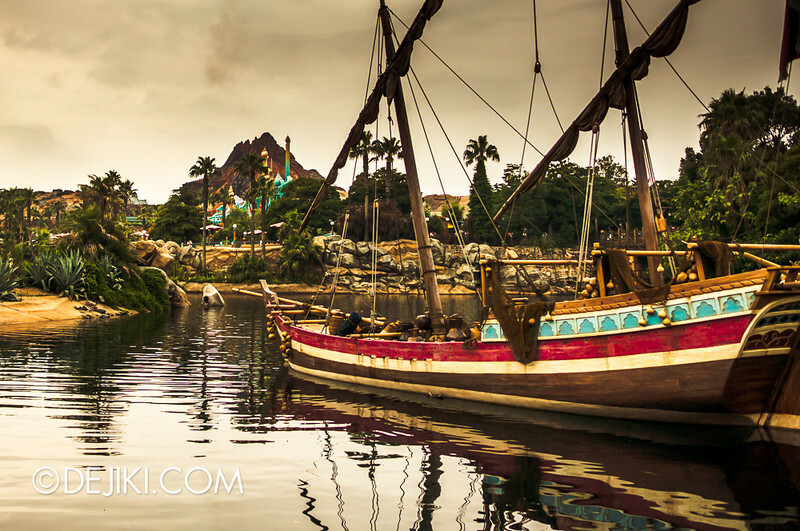 Thank you for sharing your wonderful experiences with everyone so that we can get a glimpse of what Disney does on the other side of the Pacific Ocean.